“Motor city” is another name for Detroit, but “detroit” is only part of the name for the waterway given by the French explorer Cadillac when he led the first Europeans to settle “Fort Pontchartrain du Detroit” on a bank of “le détroit du lac Érié,” the strait of Lake Erie), linking Lake Huron and Lake Erie; historically, the strait included the St. Clair River, Lake St. Clair and the Detroit River. Some time after departing the Cuyahoga, we pass this mysterious site. Any ideas? I’ll identify it at the end of this post. If you’re not at the helm, straits bring the treat of relatively close passage with other traffic, like Dorothy Ann and Pathfinder here. Perry’s Victory and International Peace Memorial is a 352′ monument we can all live with, sans controversy. As we approach the center of the contemporary city of Detroit, traffic and industry intensify. 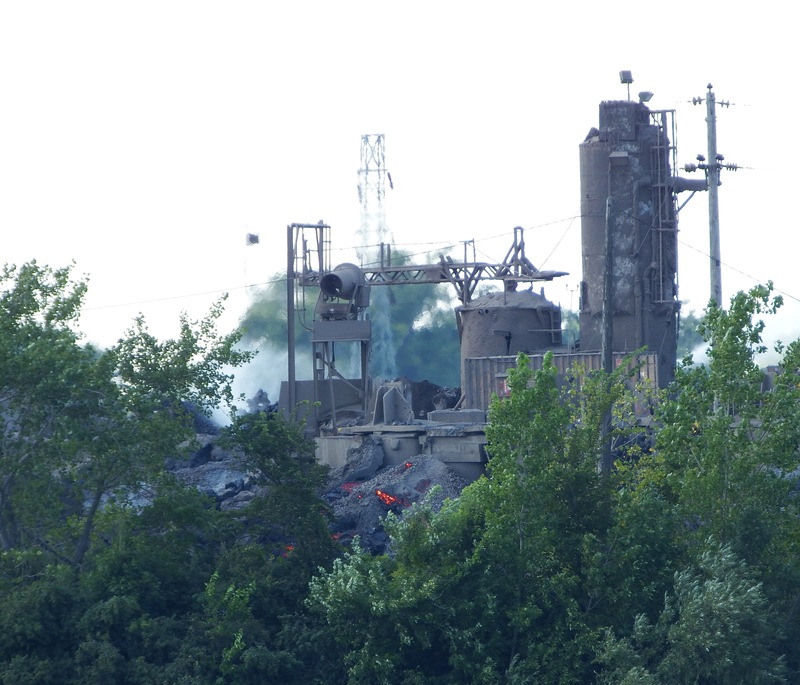 I’d never noticed GLW’s glowing slag heaps, like crafted flows of lava. 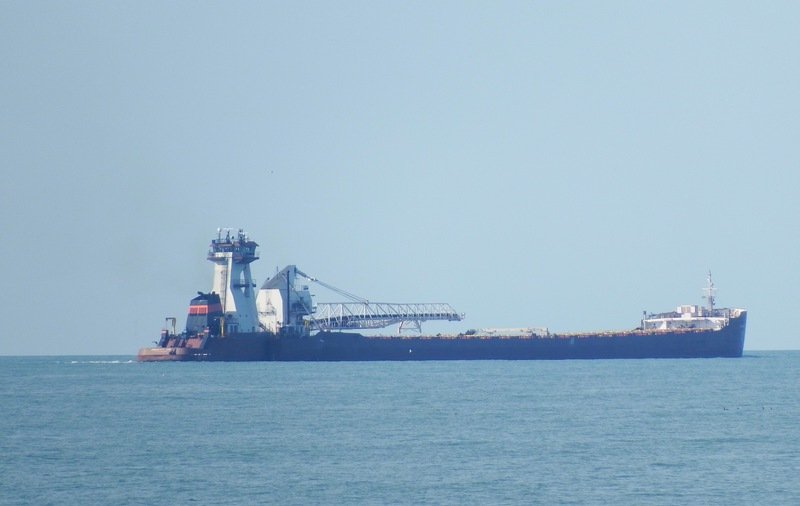 On the Windsor side, Frontenac transfers payload . . not sure what. Salt maybe? 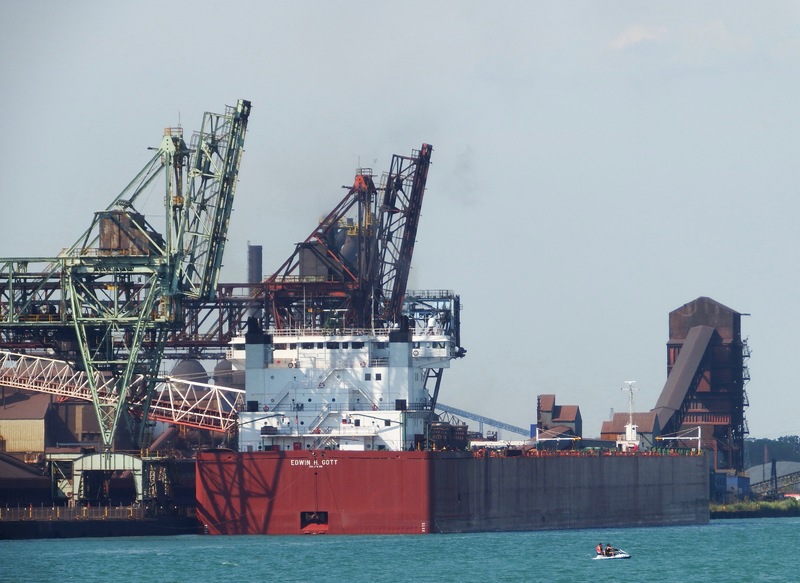 On the American side, 1000′ Edwin H. Gott is likely discharging Superior ore or taconite. 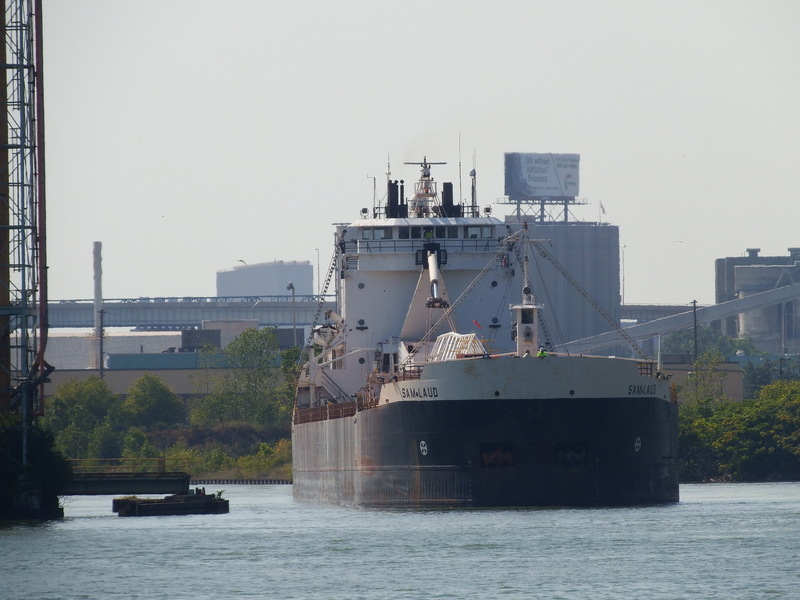 Sturgeon Bay-built Sam Laud watches from the Rouge. Laud, the namesake, moved from shop painter and riveter to CEO of GATX. 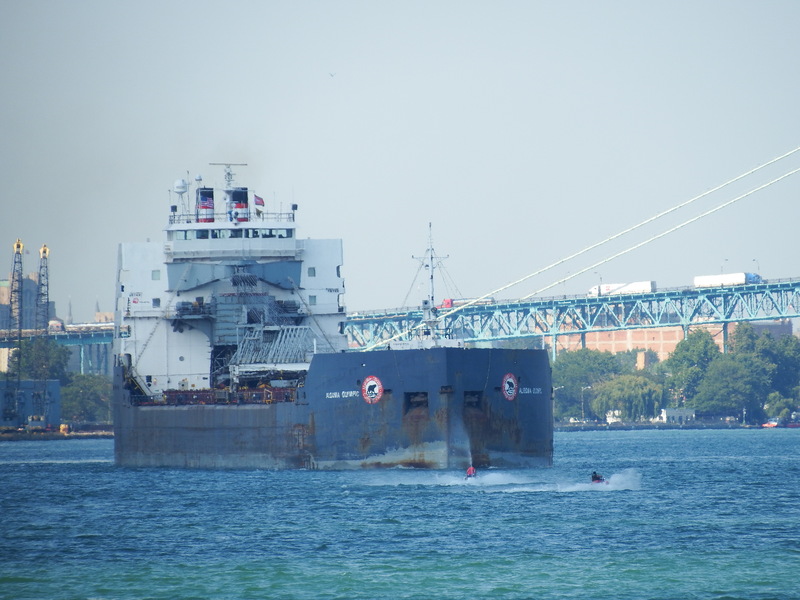 Folks on the bridge of Algoma Olympic, Port Weller-built and down bound here just south of the Ambassador Bridge, must be experiencing the frustration of having to worry about devil-may-care recreational boaters. 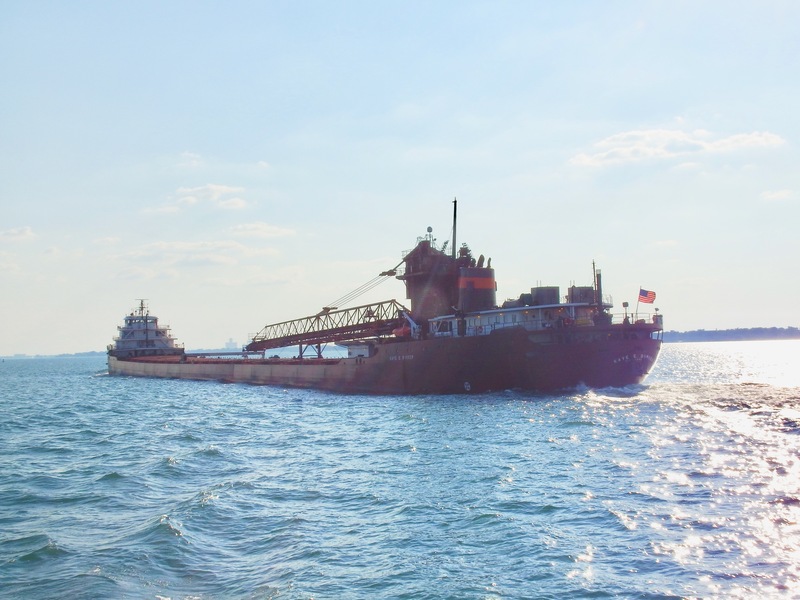 Recently, a high profile meeting of stake holders was held at Port Huron to deal with difficult small boat operators, one in particular who decided to play chicken with a freighter . 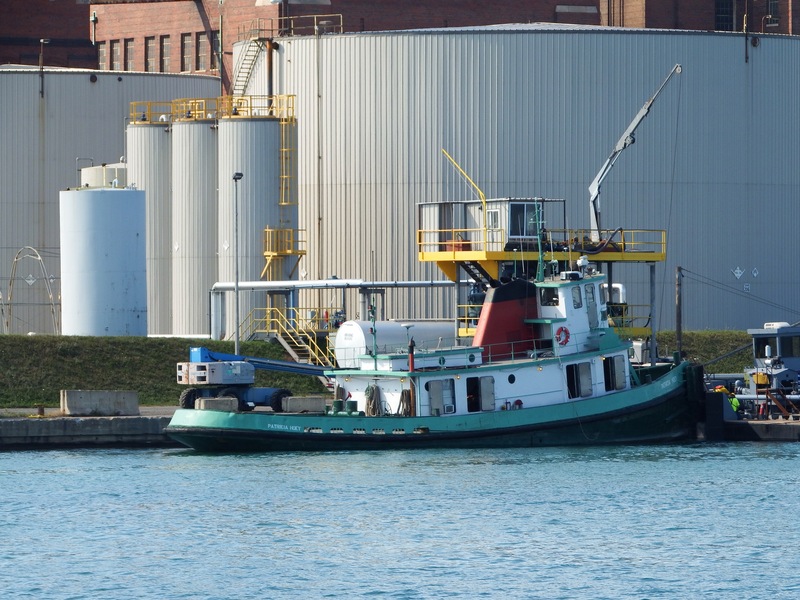 Last year this China-built tug was called Victorious; now she’s know as Leo A. McArthur, and as then, she pushes hot asphalt contained in John J. Carrick. 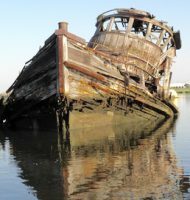 Patricia Hoey (built 1949) is a good example of the extended life experienced by freshwater boats. 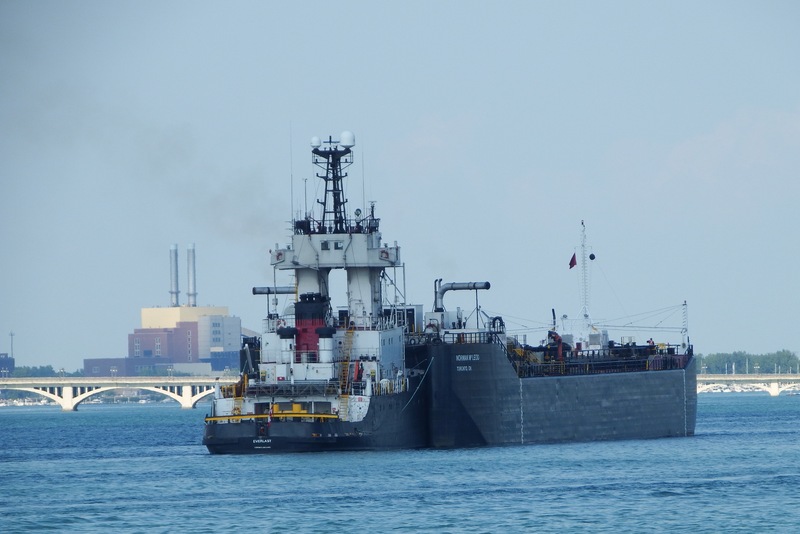 A McAsphalt unit like Leo A. McDonald, Everlast, matched as always with Norman McLeod, is Japan-built. I’d love to learn more about this Windsor home, but the name on the facade is that of the Massachusetts-born founder of Canadian Club whisky. 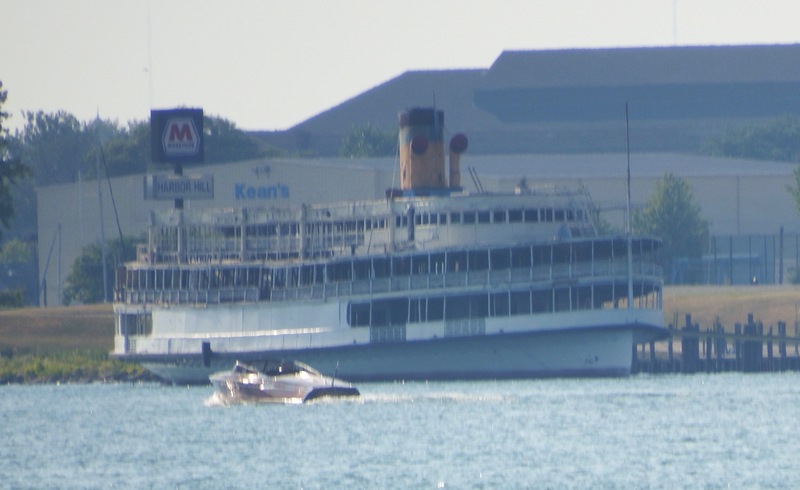 Just north of Belle Isle, SS Ste. 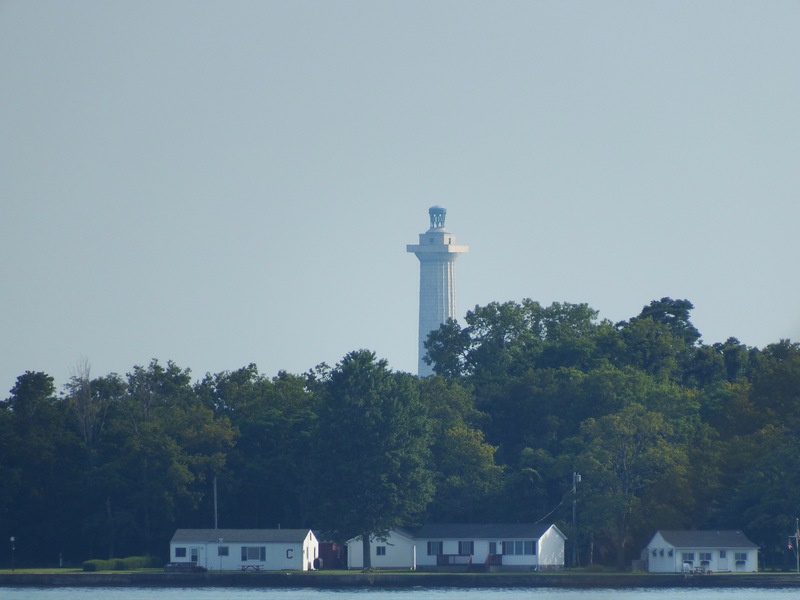 Claire, Boblo ferry sister of SS Columbia, marks Kean’s Marina. And with night falling and work for me to do, we’ll leave this post only partway through the strait with Kaye E. Barker, once Benson Ford III. 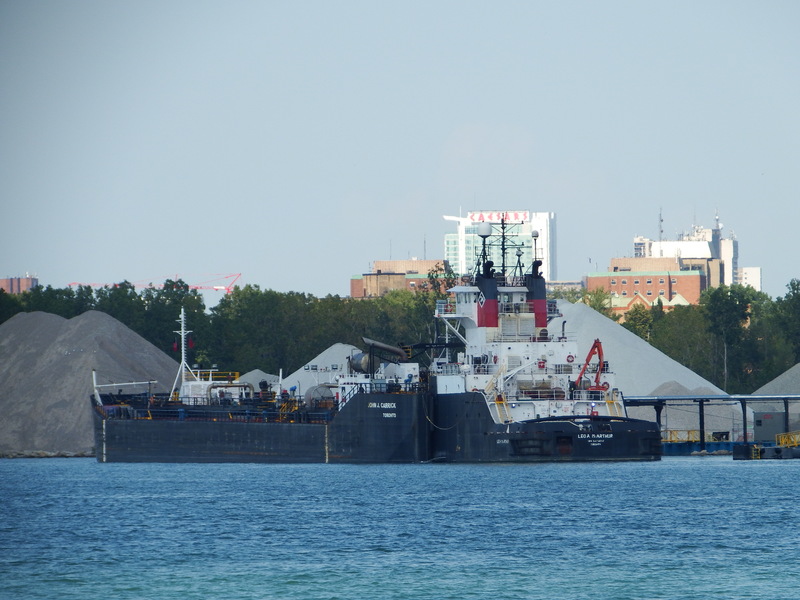 Notice the GMRenCen in the distance just forward of the front of the self-unloading arm? GMRenCen was built by Ford. The return of daylight will find us in Lake Huron. 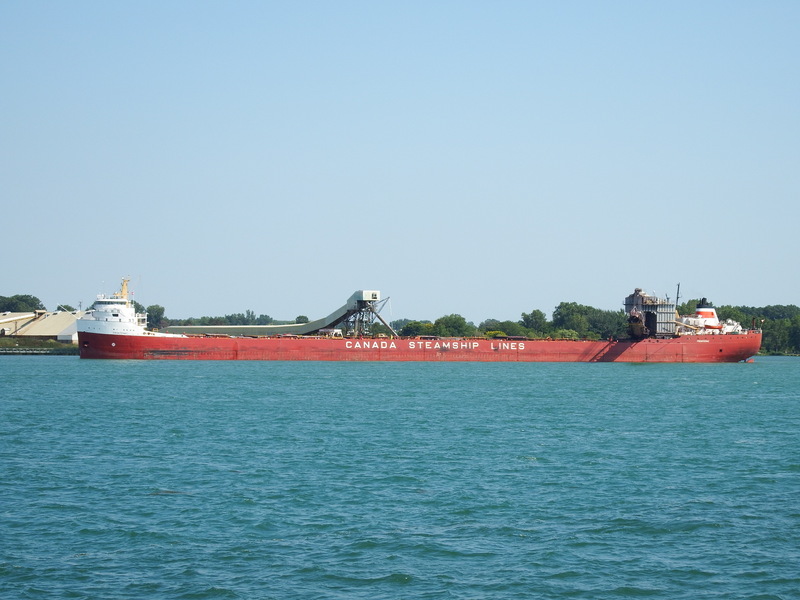 To see the St. Clair River by daylight, click here. All photos and sentiments by Will Van Dorp. 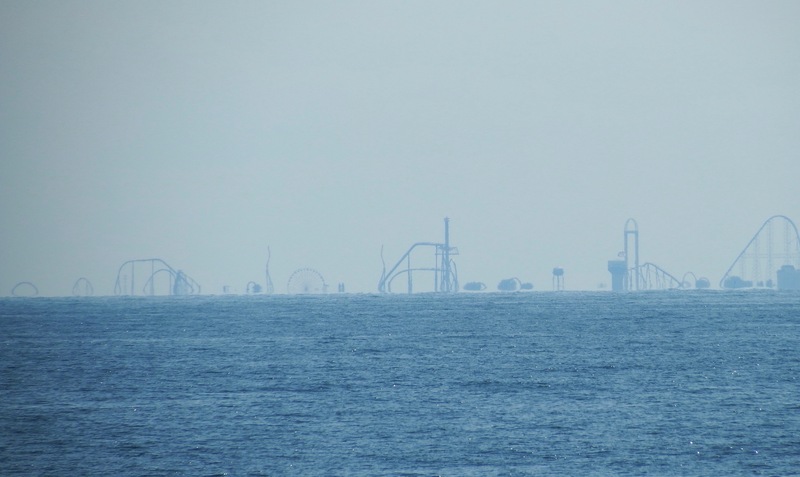 The sinuous structures in the top photo depict Cedar Point as seen from a few miles out in the lake. 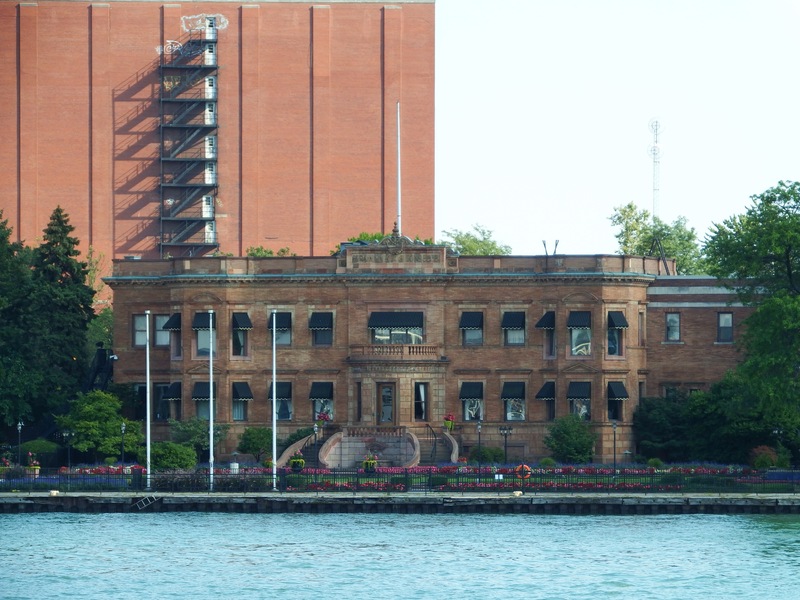 That is the Canadian Club Heritage Centre. Unfortunately slated to close if not already.